Michael Guarnieri, a Sophomore at Hillsborough High School and a member of Boy Scout Troop 489, has recently earned the status of Eagle Scout. Michael’s Eagle Scout Project included redesigning and organizing the preschool storage room at Mary, Mother of God Church, where he built shelves, purchased metal shelving units with wheels, organized the materials in new storage containers and painted walls. The project took 244 hours with the help of 15 scout volunteers and 8 adult volunteers. Michael served as Troop Guide, Den Chief and Acting Senior Patrol Leader during summer camp. He has earned 42 merit badges, achieving Double Eagle Palm and was the Boy Scouts of America Summer Camp Honor Scout. Michael is a member of the Hillsborough High School Marching Band and Brass Ensemble and was also a Leadership Intern at Camp Invention in addition to being a volunteer at Mary, Mother of God Preschool Camp. Michael sets an example to the youth of Hillsborough Township through his high level of leadership and community service, and we are proud he is a member of our community. 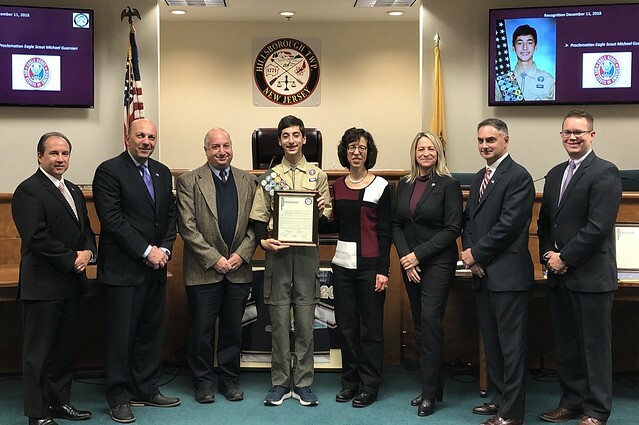 The Hillsborough Township Committee extends our sincere congratulations to Michael Guarnieri for having achieved the status of Eagle Scout, an honor for both him and those who guided him, with best wishes for a bright future. L to R: Committeeman Carl Suraci, Committeeman Frank DelCore, Michael Guarnieri and his family, Mayor Gloria McCauley, Committeeman Shawn Lipani and Deputy Mayor Doug Tomson.